APD Dumfries returned to the top of the Western Premier League on Saturday with a four wicket win over Ayr at Benfield Park Nunholm. Ayr batted first and looked set for a big total when professional Thyssen and McLaughlin completed a third wicket hundred partnership. However quick thinking by bowler Beveridge deflected the ball to unluckily run out McLaughlin for 37 and another fine piece of fielding by Chris McCutcheon ran out Thyssen from the deep for 86 to make it 162 for 8. The Ayr tail then successfully lifted the total to 215. Dumfries batted steadily but were just at 64 for 2 at half way. When a fourth wicket fell past the hundred Beveridge joined opener Chris Bellwood to provide the required impetus. He scored a rapid 54 and Silver Fern Man of the Match Bellwood did his job with an accomplished 92 not out to see the side home with four wickets left and just one over remaining. Top of the table Clydesdale lost so Dumfries are back in first place with three games left. Dumfries play at Uddingston on Saturday. CWE Nunholm lost their match at Cambusdoon in the Reserve League. Cambusdoon scored 205 with the Ian Wilson Man of the Match, Robert McBride, taking four wickets and Niall McCrossan hitting 80. Nunholm mustered a lacklustre 127 all out in reply. 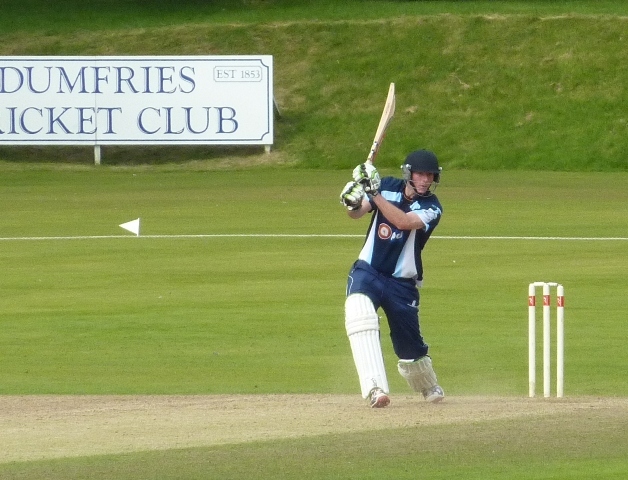 On Sunday the side lost their home Western Cup quarter-final to Glasgow Accies by 13 runs. Accies scored 206 for 6 with Aussie Bartholomew dominating with an impressive 119 not out. Nunholm were always a couple of boundaries behind the rate despite a fine 57 from Monaghans Jewellers Man of the Match Alan Davidson and valiant efforts from Richardson (36 not out) and Andy Reed (21) to get the side to 193 for 8. Scotland U19s, with Dumfries player Tom McBride, performed creditably but lost their first two group games against New Zealand and Pakistan in the U19 World Cup in Queensland. Niall Alexander had a no result with Scotland U17s at Herefordshire but the side beat Cumbria U17s in the ECB Counties Competition. Rachel Howard and Rosy Ryan played for Scotland Womens U17s in their close 3-1 T20 series defeat to Ireland. Ryan was top scorer in only her second match for Scotland to help the side recover and post a total. Women’s coaching takes place on Mondays from 6:15-7:30 at Dumfries Sports Club, Nunholm Road. Beginners are particularly welcome. For details contact dumfriescricketclub@gmail.com, or Trefor Williams on 01387 256455 or see www.dumfriescricketclub.co.uk .